Suncorp’s $1bn extreme weather loss. Climate change, anyone? Suncorp Group held its Annual General Meeting in Brisbane today and several shareholders pointed out that in the last financial year, Suncorp was hit by losses from natural disasters of $473 million above provisions. The Brisbane hailstorm in November, Cyclone Marcia in February and NSW storms in late April all contributed to the tally. This is not new territory for their insurance business. In fact, this is the fifth year in the last six where losses from natural disasters have exceeded provisions, totalling well in excess of $1 billion. Was this due to inadequate provisioning? Or are we witnessing climate change in action, and insurance companies failing to adjust to the change? CEO Patrick Snowball said they have been forced to add a “management overlay” to their natural disaster provisions, presumably because their models aren’t up to it. 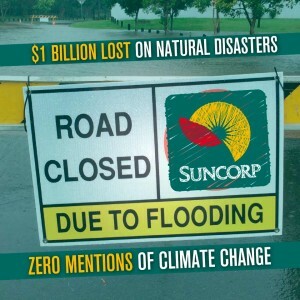 Suncorp itself has stated that the primary impact of climate change on its business would be increased frequency and severity of natural disasters. 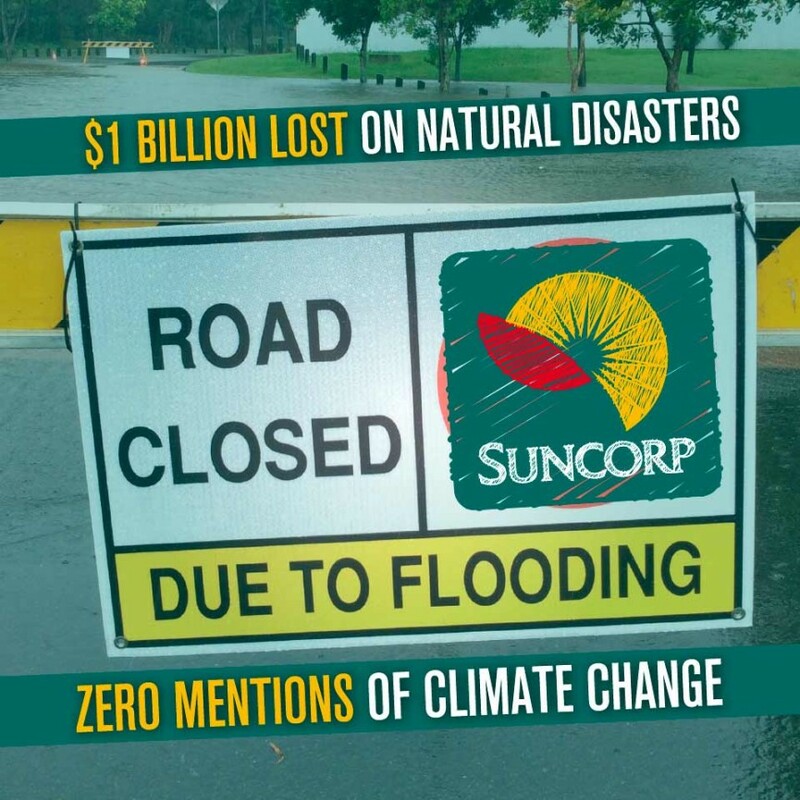 Despite this, Suncorp has not mentioned climate change once in five years of annual reports. Not once. Climate change doesn’t even get a mention in its Risk Management Framework. What is going on here? Suncorp voluntarily reports to the Carbon Disclosure Project (CDP) on an annual basis. In that report, the company addresses how its businesses will cope with climate change impacts, and how it intends to reduce its own emissions. Much of Suncorp’s approach to public policy change seems to relate to risk mitigation and adaptation resiliency, which should be applauded. However, it seems that lobbying government for tougher action on carbon emissions is not on their agenda, as Suncorp Chairman Ziggy Switkowski chose not to disclose the nature of the conversations he has had with government ministers. Suncorp believes that its reputation is not at risk from climate change, as it has limited exposure to carbon intensive industries through any of its businesses. This may well be true – it is not clear whether Suncorp provides insurance to coal mining companies and associated businesses. 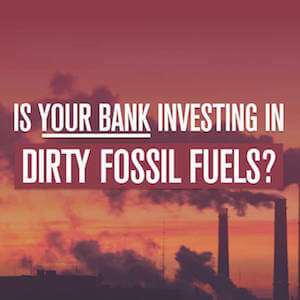 Suncorp Bank has told us that it doesn’t provide loans to fossil fuel projects but if it is underwriting loans or fossil fuel industry assets, it has just an important role in sustaining the industry that is driving climate change. When questioned by shareholders, Ziggy Switkowski confirmed Suncorp is exposed to fossil fuel companies via its investment portfolio. Is it not hypocritical for an insurance company to be invested in the very companies driving climate chaos? Mr Switkowski has formerly advocated for a 60% reduction in carbon emissions by 2050. Why did Mr Switkowski or Mr Snowball not stand up for carbon pricing when the Abbott government came to power in 2013? If the last financial year is anything to go by, the impacts of climate change on the bottom line of insurance companies will only worsen. Knowing this, is it not in the interests of shareholders for senior executives to lobby for tougher action on climate change? If Suncorp’s attitude is reflective of the rest of the insurance industry, we’ve got a problem. Insurance companies are being asked to simultaneously insure the finance and physical assets that keeps the fossil fuel industry going, while paying out more and more on the impacts. If the penny doesn’t drop soon, billions of dollars and the livelihoods of millions of people will.